My birthday fell on a Saturday this year (it's so nice when this happens!). 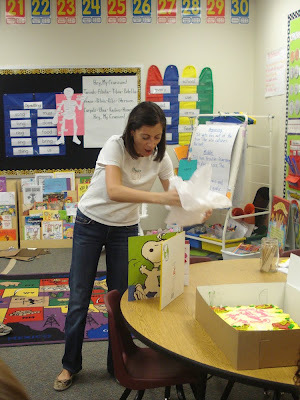 My sweet first grade teammates started me off on Friday morning with Starbucks and birthday goodies - what a treat! They even sang to me at lunch! At the end of the day, my room moms came in with a "Happy Birthday Mrs. Klein" cupcake cake and a card signed by all the kids in my class (they had gone around at lunch one day having them all sign it - sooo thoughtful!). Five moms came in to join the celebration and one snapped this photo of me opening the class gift (a wallet stuffed with gift cards - what a spoiled teacher I am!). 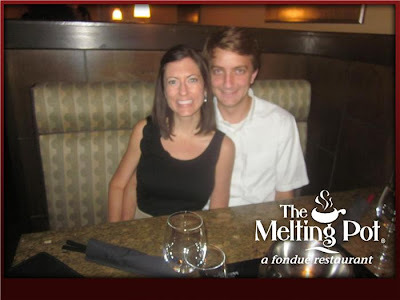 That night Max took me out to my favorite birthday meal - fondue! He surprised me before dinner with the iPhone 4s! He had been hiding it for a whole week! We've gone out for fondue on my birthday for the past four years now - here we are ready to cook our main course Bourguignonne style (yes, in hot oil - birthdays are no time to skimp on calories). 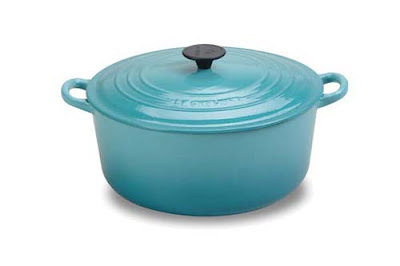 On Saturday we went gift certificate shopping and I picked out this big Le Creuset dutch oven! I'm super excited to cook up yummy stews once the weather gets chilly (the 98 degree high on my birthday was so not chilly). 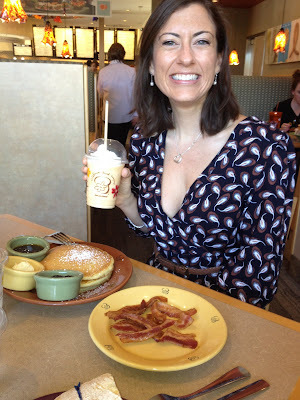 We also headed out for pancakes - these Lemon Ricotta pancakes from Wildflower Bakery are tied for number one on my list with the Red Velvet pancakes from the Herb Box. Both are delish! Max also surprised me with tickets to see... Taylor Swift! I adore her! I donned cowboy boots for the occasion. She played for two nights in Phoenix to sold out crowds. Here is our view from our seats before the concert looking away from the stage (that's approximately 14,000 fans!). I'd heard from friends who went to see her Fearless tour that the crowd was really into it, and it was totally the same here - everyone was on their feet for the whole 2 1/2 hours she was on. On her last tour she apparently went up into one of the upper sections to sing a song and hugged everyone in the section. For this performance, she made her way to the very back part of the floor and sang about three songs from there (while sitting on a rotating tree that had dropped from the ceiling). Most of the time of course she was on the main stage. The stage setups were great and some incorporated backup dancers doing Cirque du Soleil type acts in the back. This one was beautiful - a bridge dropped from the ceiling and was filled with violinists who played while Taylor was at a piano singing Enchanted. At one point, Taylor brought out Jim Adkins from Jimmy Eat World to jam! The song brought me back to college when I first started listening to Jimmy Eat World, who is apparently from nearby Mesa! Taylor ended with Love Story, which came out in 2009 just before Max proposed so the song will always remind me of that : ) The part where she sings about being proposed to gets me every time! For this encore she climbed on a little balcony platform that had been lowered down from the ceiling. Of course Max had already pointed the hanging balcony out to me before the show (along with the suspended tree, the computer controlled lights, and the speakers - gotta love my engineer) but we didn't know that Taylor would be climbing in and traveling through the air all over the stadium for the last song! I loved that she ended in a ball gown with tons of glitter in the air : ) It was an amazing concert! What a wonderful birthday weekend! Chocolate fondue is my favorite! Sounds like a great birthday weekend! And girl, you got hooked up on the birthday gifts! Iphone & T.Swift! And how sweet about your class gifts! I love that part of being a teacher!!! HAPPY BIRTHDAY!!! Sounds like it was the best! Happy Birthday! 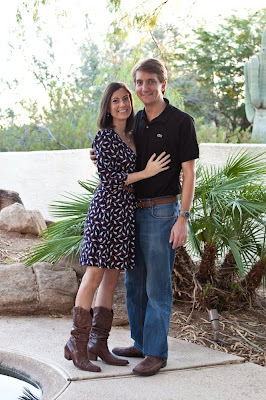 I love your boots and dress!